Triggered by the interesting discussions (https://forum.rowinginmotion.com/) and the availability of measured data, I have recently spent some time on updating my model. 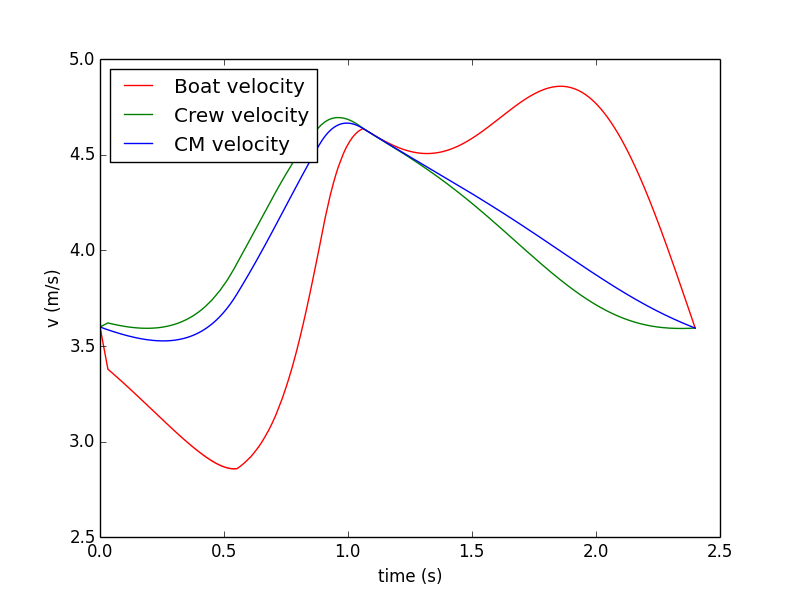 It was never my intention to make a super detailed model that would be able to reproduce each and every speed and acceleration peak and valley from a measurement on a real rower. Instead, I wanted to make it just realistic enough to be able to play with the parameters and see how they effect rowing efficiency, in order to trigger some discussions about rowing technique and rowing style. What happens in reality of course is that one places the blade a fraction of a second after one reverses the body CM velocity. There were two ways to improve this. First, I added some “generic” recovery profiles which would be able to simulate that fraction of a second as part of the recovery phase of the stroke. Nothing wrong with that approach, except that it was difficult to calculate a recovery profile which generated the right “catch CM speed”, with the right stroke length and everything. I still have provisions for this in my software, so once I have some time I can start using this route. The blade is “placed” at the moment that these two velocities are equal (or, to be precise, at the moment that the velocity before placing the blade starts to exceed the velocity if the blade had been placed). In rowing terms this moment of placing the blade would generate a beautiful V-shaped splash. Too early, you have a front splash and are stopping the boat. Too late and you are missing water and have a back splash. The picture shows a typical stroke. 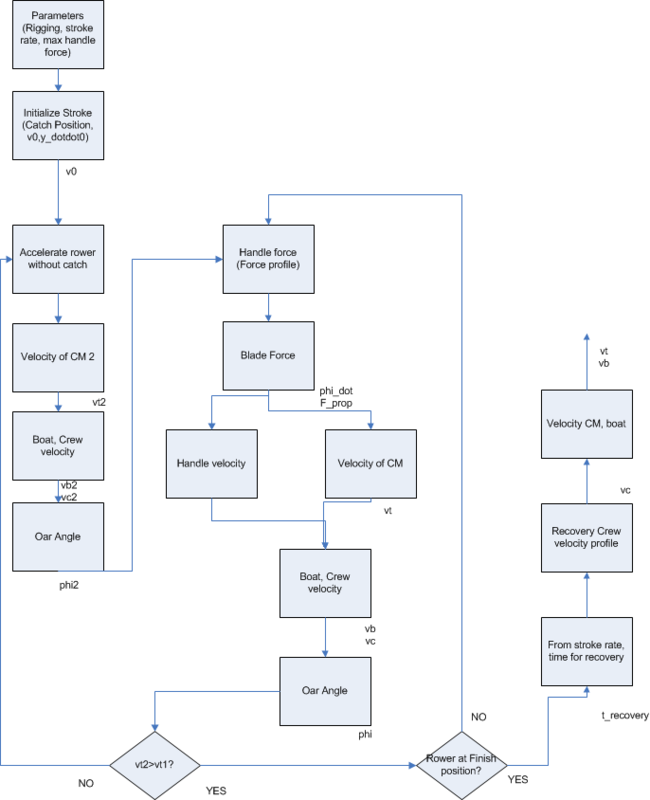 So now I have continuous velocity profiles. I still have jumps in acceleration, where in a real system also the acceleration change would be smooth, but for the moment I consider it not necessary to make my model that realistic. Of course I was interested to know if this improvement would invalidate any of my previous published results, so I reran all simulations of previous blog posts (and some more). I am happy to report that everything still holds. 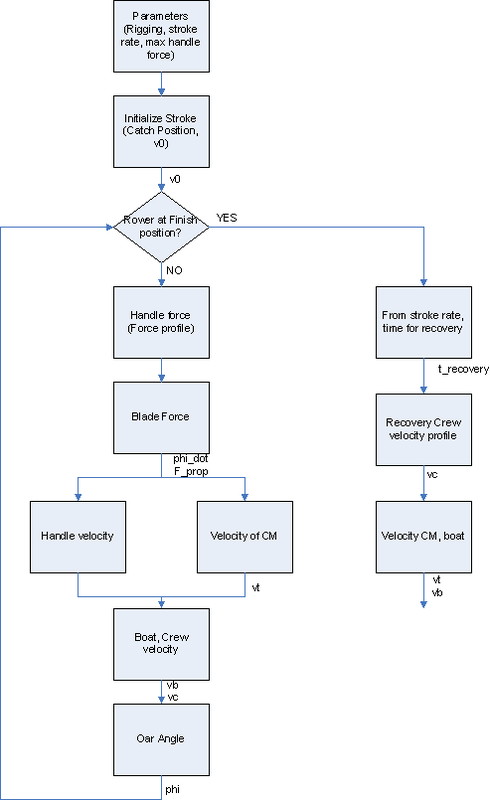 This entry was posted in Uncategorized and tagged rowing physics on April 16, 2015 by sanderroosendaal.